"Dr. Chu is attentive, professional, and has a great bedside manner." "The office staff is friendly, professional, and responsive." "Dr. Chun is empathetic, competent, smart, sweet, professional, patient and caring." "Dr. Rachel Shu is an incredibly skilled clinician. In a word, she is brilliant. " "I'm so happy I've got a place I really trust, and I feel like they care about me!" "Karen Chu listened to me and made me very comfortable." "She is a gifted diagnostician who has correctly diagnosed conditions/illnesses." "You can literally sit there and talk to her like she is your best friend!" "She's wonderful, thorough and gentle." "She is always very courteous and professional." 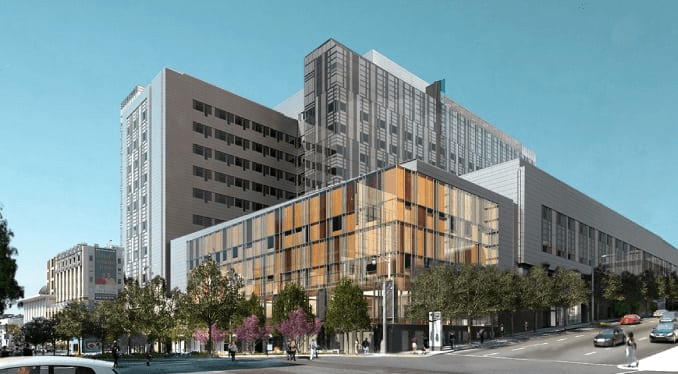 We Would Like To Welcome CPMC's Newly Built Van Ness Campus To The Neighborhood! Our Daniel Burnham Ct office is located on the Post St side of this modern, state-of-the-art campus. Call us or schedule your appointment online. We hope to see you soon. A caring team of doctors, nurses and staff in the heart of San Francisco! At San Francisco Women’s Healthcare, Inc, Dr. Rachel Shu, Dr. Stephanie Chun, and Dr. Karen Chu serve women throughout the Bay Area from offices located in Downtown San Francisco and the Laurel Village neighborhood. The office specializes in obstetrics, fertility, menopause and gynecological needs. Patients have access to a wide variety of services including prenatal care, infertility consultation and treatment, a variety of birth control including the IUD and Nexplanon, and gynecological treatments for conditions such as vaginal dryness, pelvic pain, pelvic prolapse, and symptoms of menopause. Women’s needs and their health come first at San Francisco Women’s Healthcare, Inc. The doctors are dedicated to providing sensitive and thorough care and building lasting relationships with their patients. Most new patients come through recommendations and referrals because the staff are caring, knowledgeable, and take the time to truly listen to their patients. The doctors specialize in providing minimally invasive laparoscopic surgeries. These surgeries offer better patient outcomes with more rapid recovery, less pain or discomfort, and few scars. The doctors at San Francisco Women’s Healthcare currently are welcoming new patients. Most major forms of insurance are accepted. Our doctors and staff speak Mandarin and Cantonese! Our doctors and staff speak Mandarin and Cantonese. We Are Excited To Announce That We Are Now Accepting Hill Physician Medical Group Members. 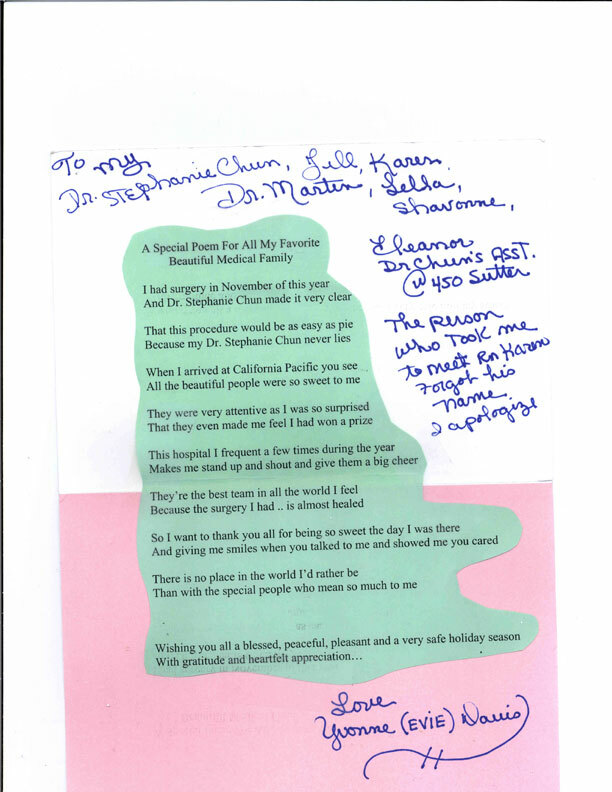 Read a poem written to us from our patient! With the beginning of 2018, we have successfully moved our downtown office to One Daniel Burnham Court. We encourage you to come visit our new office in this modern and updated building. While it is centrally located in San Francisco, the office building carries a more quiet and relaxed atmosphere. It has been refreshing to be away from the congestion of Union Square. Parking is no problem here: surrounding metered street parking is usually available, and the building has a public parking garage. The entrance for the garage is on Post St. between Franklin and Van Ness. Transportation here via Muni, BART, cable car or ride sharing are easy alternatives. Of course, our other office at 3838 California Street is still open and available for appointments. Regardless of which office you choose, we look forward to continue providing our patients with compassion and excellent quality of women's healthcare. -The main entrance of the DBC office is on Daniel Burnham Court, an alley street connecting Van Ness and Franklin Streets, located between Post and Sutter. -MUNI buses #2, #3, #47 and #49 provide easy access here. -The public parking garage entrance is on the left side of Post St, which runs one-way eastward, between Franklin and Van Ness. Metered street parking is also available. -The 3838 California Medical Office Building on California St., between Arguello and Cherry Streets. -MUNI bus #1 is the most direct line here. Public parking garages and street parking are available nearby. At San Francisco Women's Healthcare, we accept most major insurance plans. Here is a short-list of just some of the most popular plans we accept. Please contact our office if you do not see your insurance provider listed. Please be prepared to bring your current insurance card with you for your appointment. Our office requires payment at the time of service. "SF Women's Healthcare makes me feel like a priority; they never make me wait or feel rushed even when they're really busy. I actually look forward to my annual!" "I have the utmost confidence in her knowledge and the expert level of care I get at Women's Health." " I had a great experience here. Everyone is friendly and attentive. Karen Chu was patient and caring."